Some time ago, we reviewed the Hercules RMX-2 and the 4-MX DJ controllers which were both made of metal and had lots of professional features for all levels of DJ&apos;s. This week, we received the newest Hercules DJ controller called the Control Air+ (Plus) which is an update to the first Control Air which was the first DJ controller to integrate an IR sensor to control effect parameters. The Control Air+ has an updated layout, bigger jog wheels, and more features than the original. Check out the review to see how it works in the booth. The new Hercules DJ Control Air+ is the latest two-deck/two-channel digital DJ controller offered by Hercules DJ Division that comes bundled the new DJuced 40 DJ software. The Hercules Air+ is the updated controller of last year’s Hercules Air which was the first DJ controller to allow DJ’s to control effect parameters via an infra-red sensor. 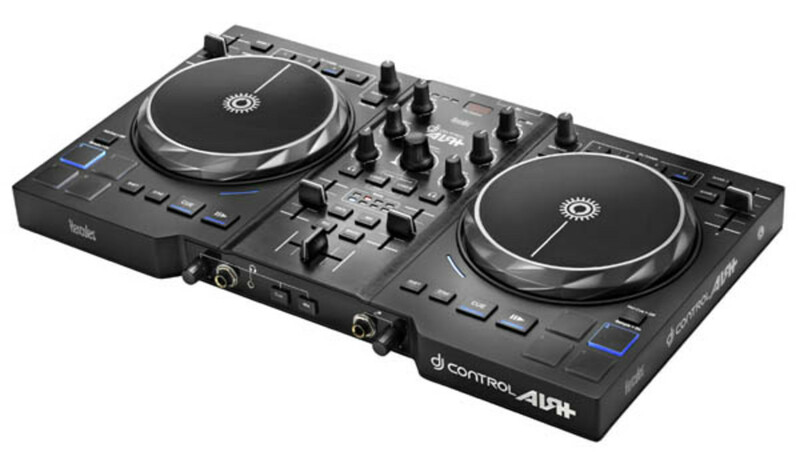 Both controllers look very similar at first, but the Hercules DJ Control Air+ has a better layout, bigger jog wheels, more volume on the outputs and is also the biggest DJ controller that Hercules has produced to date. The Hercules DJ Control Air+ is still a compact controller and can still fit in a backpack pretty easily. The Air+ is made of mostly all plastic, but it still has a substantial weight to it and the construction overall feels promising. I personally favor the overall compact size of the Hercules Air+ which puts it right in the same size-class of a Traktor Kontrol S2, Stanton DJC.4, or a Vestax VCI-380 controller making it easy to take it with you on the go. All of the knobs on the unit have actual metal posts underneath the rubber grip surface meaning that the adjustment knobs will hold up to some abuse when in storage and during transport. I didn&apos;t expect to see metal knob posts as the rest of the entire controller is plastic. The plastic construction is also reflected in the price of the Hercules Control Air+ ($250) and is aimed at the beginner to casual user who is interested in getting some DJ time in the bedroom or for small parties or gatherings. Mostly all of the buttons on the Air+ illuminate a very bright blue color to let the user know what features are active at a glance. The buttons have a rubberized coating to them and they always felt pretty responsive throughout the tests. The Air+ is all USB powered. One of the main reasons for the upgrade of the original Air controller was to allow for higher output volumes due to the lack of a power supply. I’m happy to report that all of the lights are bright and the volumes of the headphone and RCA outputs are adequate enough for live performance situations. The Hercules Air+ is also a fully MIDI-mappable DJ controller that can work with almost any DJ software out on the market today. For this review, we only tested the unit with the supplied DJuced software package that comes with the controller, as this is what most users will end up doing when they purchase the unit anyway. There were no available mappings for Traktor or Serato anywhere to be found on the Hercules website, so if someone wants to use the Air+ with another DJ software, then the mapping will have to be done manually. The setup of the Air+ Controller is very easy with the user only having to use the supplied CD to install the ASIO Driver (on Windows machines) and the DJuced Software for the controller while plugging in the USB connection to the computer. You must also plug in your speakers through the supplied RCA Master Outputs on the back and you’re ready to play your digital audio files through the software and the Air+. There is also a headphone output (1/4-inch and 1/8-inch) and Microphone input found on the front of the unit for monitoring and speaking. There is a Cue button and Mix button on the front panel which allows the users to playback either the cued deck or the Master output through the headphones. There is also a black knob next to both connections to control the volume of the headphones and the microphone. The Hercules Air+ doesn’t have any additional outputs or inputs for additional speakers or decks. The DJuced 40 software is a good match for the Air+ as it’s pretty easy to use and the layout is similar to all the other popular DJ software out there on the market today. The DJuced 40 software has a nice mixture of effects, cue points, loop controls, sync, sample banks, and all the other usual DJ software features that controller DJ’s use today. It&apos;s worth pointing out that the DJuced 40 software is the full-featured DJ software and not the "Lite" version of the software that many other DJ controllers come bundled with at this price point. For more information on the DJuced software, please head on over to wwwdjuced.com to see for yourself. 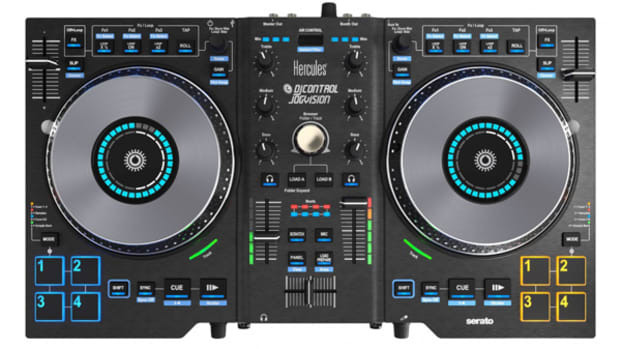 The Hercules Air+ has lots of features and functions that DJ’s need and want for mixing and beatmatching. All of the EQ knobs are spaced well and have a rubberized coating that makes manipulation easy. The three-band EQ knobs are the “Full Kill” variety and the sound was good overall. There is a file browse section in the middle of the Air+ with a big oversized browse knob for selecting tracks/folders and a Load A and Load B button for loading tracks onto the decks. Underneath the file browsing section is an LED Beats counter indicator that scrolls from left to right at the pace of the beat. This Beat indicator is another tool for DJ’s to use to get the beats matched correctly while mixing. Underneath the Beats LED indicators are four buttons for different controls. There is a Vinyl button to change the jog wheels from vinyl mode (scratching) to jog mode (nudging for beatmatching); a MIC button to activate the microphone input; a REC button to record the mix through the software, and a MAGIC button to activate the Loopsplit function in the DJuced software. 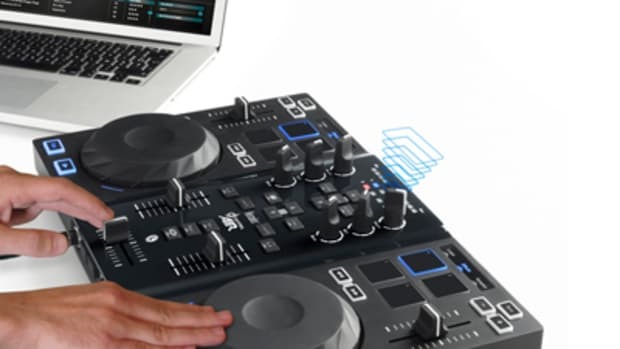 The MAGIC button allows DJ’s to create loops then split them into four equal parts which then correspond to the four pads for manipulation similar to the Loop-Slicer function found on the Vestax VCI-380 or DDJ-SX. The crossfader has a plastic-like feel to it, as is the case with most plastic DJ controllers, but it performed well for mixing and baby scratching. The Crossfader is pretty accurate but not accurate enough for rigorous movements or battle-worthy scratching. The crossfader curve can be set to either Mix-Mode or Scratch-Mode within the setup options in the DJuced 40 software. The Line faders have a much tighter feel to them when compared the crossfader and they are nice and smooth for accurate mixing. The Line faders don&apos;t have any adjustments, but they are longer than the crossfader to get the levels just right. The Air+ doesn’t have any LED indicators for volume levels, so level-matching will have to be done within the software. The Air+ DOES have a gain knob for each deck to get the volumes just right. The gain knobs also double as Low/High Pass filter knobs depending on the button mode indicator. The jog wheels on the Air+ are the largest jog wheels that Hercules has ever produced in a DJ controller, coming in at 5.9-inches each. They have a rubberized grip texture on the top for scratching/cueing and high-profile plastic sides for nudging and pitch bending. The jog wheels are pretty accurate and the latency/response within the DJuced software is actually pretty good. The jog wheels are not touch-sensitive, but rather pressure sensitive meaning the user has to push down on the surface to interact with the track. Due to this pressure activation, the jog wheels feel a bit wobbly but they felt good enough for normal playback and cueing. My main gripe with the jog wheels is that they are a bit too tight with above-average resistance which makes it hard to move the jog wheel back and forth quickly. The Jog wheels can be in either Vinyl Mode or Mix mode depending on the style of play that is needed. You can toggle between the two modes by pressing the Vinyl button in the middle of the unit. Remember that both jog wheels will inherent the setting, so make sure you want both jog wheels in the same configuration all the time. Under each jog wheel there are the Cue, Play/Pause, Sync, and Shift buttons. Towards the outsides of the controller jog wheels lie the tempo sliders. The Tempo sliders work nicely for beatmatching and they have a good amount of tension to them and a center-click so you know when you are at absolute zero. They are not super-accurate, but they worked well enough for my mixing needs throughout our tests. The four velocity-sensitive performance pads for each deck on the Control Air+ have been moved from the top of the controller to the absolute bottom corners of the controller. I suppose the change was made so that users can drum and cue with the pads easier without having to reach over the jog wheels during a performance. The pads are rubberized and LED backlit in blue when active. The pads are somewhat stiff and they don’t have a click or indicator to let the user know when they have been successfully hit. They don’t really have any feedback to them, but they worked every time they were pressed. Even when the pad is hit off-center, they still manage to trigger the function. These eight velocity pads are used for Hot Cues and Samples. There is a small MODE button right next to the pads that allow the user to cycle through the different modes. When in Sample Mode, the four pads turn into Sample pads that allow the DJ to trigger samples on the fly. When in HotCue Mode, the four pads are now HotCue triggers that can be set by pressing the button when the track is at the correct position and deleting them by holding the shift key and pressing the corresponding pad. The pads are advertised as Velocity-Sensitive meaning they can tell just how hard you press them. When using the pads for samples, the volume of the sample corresponds to how hard the pads are hit. Above the Jog wheels are the FX and Loops sections. There is a Bank 1 button that activates the FX and the Bank 2 button activates the Loops. When in Loop Mode, the first two pads are Loop In and Loop Out, while the last two pads are used to shrink or grow the loop count. When in Effect mode, the four pads will turn into four effects of your choice. Simply press the pad to start the effect and press it again to turn it off. In the middle top portion of the controller is the Air Control Infra-Red sensor that allows users to adjust the FX parameters. After an FX is activated, the DJ can then move their hand (or other object) up and down over the Air Control IR sensor to adjust the wet/dry of the effect. There are LED indicators on the left and right side of the IR sensor that shows just how much of the effect is currently applied using the IR sensor. This is the main feature that sets the Air+ apart from the rest and it is a lot of fun to use the Air Control sensor for effects and it was also quite accurate throughout our testing period. In Conclusion, The Hercules DJ Control Air+ is a good compact and ergonomically pleasing controller with a good price-point and lots of easy-to-use features right out of the box. 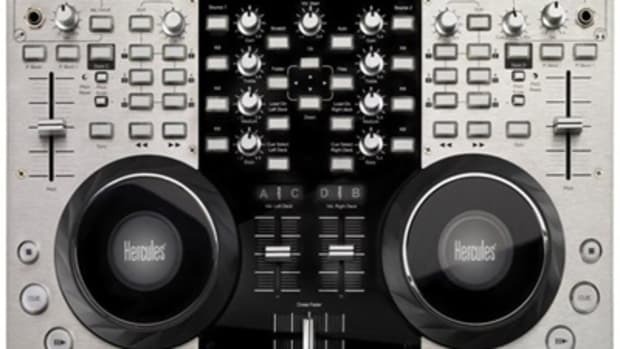 The Hercules Air+ comes bundled with the DJuced DJ software to get the user up and running quickly. The Hercules Air+ also sports the popular four-performance pads per deck for Samples and HotCues and a cool Air Control Infra-Red port for intuitive effect parameter control which both work well for performances. On the downside, there are a limited number of inputs and outputs which makes the Air+ a relatively "closed" DJ system where you won’t be able to add additional decks or speaker to the setup. There aren’t any LED volume indicators or a Master volume knob to adjust the full mix levels on the fly. The tension of the Jog wheels is also a bit on the tight side which made it difficult to move the platter back and forth for quick tricks/movements. Overall, the Hercules DJ Control Air+ is a good update to last year’s Air as this new iteration improves upon many of the shortcomings of the original unit. 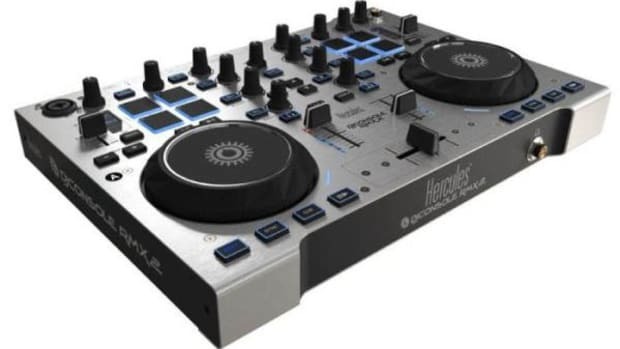 We are going to recommend the Hercules Air+ controller to any new or beginner DJ’s who wants an up-to-date DJ controller with lots features at an inexpensive price. Air Control Infra-Red Effects is fun to use!